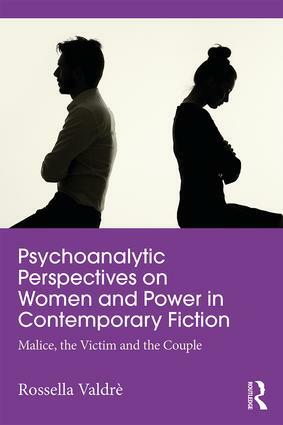 Psychoanalytic Perspectives on Women and Power in Contemporary Fiction psychoanalytically examines contemporary fiction portraying the female in a reversal of the stereotyped victim role. The recent popularity of powerful female characters suggests that literature is ahead in its understanding the desires, fantasies and unconscious emotions of the public. This book explores a form of intimacy frequently observed in consulting rooms and in life in general: malicious intimacy. Specific to the conjugal bond, it is a type of intimacy connected to the relationship between the two halves of the couple that is extremely powerful and painful. Instead of clinical cases, Rossella Valdré examines four contemporary and widely successful novels, published contemporaneously, which capture perfectly this type of psychopathological universe. Valdré then maps out psychoanalytic hypotheses regarding the persistency of these malicious intimacies. Through analysis of these examples, Valdrè investigates the roots and hypotheses of a new scenario on victim-executioner roles played out in the intimacy of the couple. Exploring how and if the contemporary couple is undergoing profound changes, she provides an overview of the various deep-seated psychological mechanisms and unconscious dynamics that may be at work. The book explores the need to not be dependant upon a love object as an extreme defence against abandonment or self-collapse. Valdrè argues that such a configuration is very common, and that Idealization in contemporary life is one of the reasons behind the most of sufferance in modern couples, something which psychoanalysis can examine through art. Women, perhaps, after emancipation, are living overturned roles and paying a higher cost as a result. Psychoanalytic Perspectives on Women and Power in Contemporary Fiction will appeal to psychoanalysts and psychoanalytic psychotherapists, and be of interest to scholars and students of literature, gender studies, philosophy and sociology. From the Preface: "Through these novels: Gone Girl-Gillian Flynn, The Silent Wife-A.S.A. Harrison, Unravelling Oliver-Liz Nugent and Hell Hath No Fury-Ingrid Noll, Rossella Valdrè’s describesan overturning of the ill-treated and the abusive and malicious women sides. She combines cultural, experiential and psychoanalytic details showing critical marriage aspects: the mutual idealizations, the subsequent illusions and unconscious projections. She looks at truth that remains unsaid, ordinary women, like us: they need to be placed in the contemporary world, to look at things widely, with awareness. Her books always intercepts emotions, unconscious aspects of her and her unconscious profundities. "-Donatella Lisciotto, Full Member of the International Psychoanalytic Asssociation. Introduction– Will You Please Be Quiet, Please? V – The new feminine. Rossella Valdrè is a psychiatrist and a full member psychoanalyst of the Italian Psychoanalytical Society and the International Psychoanalytical Association, based in Genoa. Her fields of interests include cinema and psychoanalysis, the extension of psychoanalysis into the world of culture, art, literature and society, always focusing in the light of psychoanalytic theory and Freudian metapsychology revisited in contemporary life. She has authored several books, articles and reviews on cinema and psychoanalysis.